University of Washington (UW) researchers have identified a gene involved in susceptibility and resistance to tuberculosis. This same gene, they have found, has a role in the severity of leprosy, which is caused by a related pathogen. The researchers also have learned why this gene is important for susceptibility. The gene, lta4h, appears to orchestrate pro-inflammatory and anti-inflammatory responses. When these responses are balanced, the body destroys invaders without unduly hurting itself. But an imbalance results in problems. Either the infection takes hold or damage occurs from an overly aggressive defense. The findings will be published tomorrow, Friday, March 5, as the cover story for Cell. "For a long time, burning questions have been, Why do people differ from each other in their susceptibility or resistance to TB, even when they have the same exposure? Why do those who do contract TB vary in the severity of their illness?" 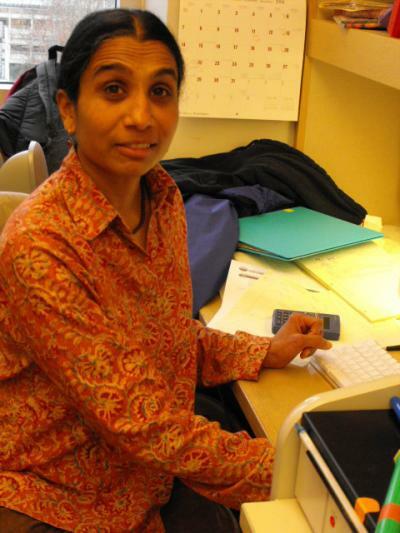 posed the study's senior author, Lalita Ramakrishnan, associate professor of microbiology, medicine, and immunology. The answers came from zebrafish, a tiny fish whose home is the Ganges River, as well as from people from Vietnam and Nepal. First, UW researchers David Tobin, John Ray and Lalita Ramakrishnan created random mutations in zebrafish larvae in collaboration with Cecilia Moens, a Howard Hughes Medical Institute investigator at the Fred Hutchinson Cancer Research Center in Seattle and her postdoctoral fellow Gregory Walsh. They then inoculated the larvae with mycobacteria similar to the germ that causes human tuberculosis. 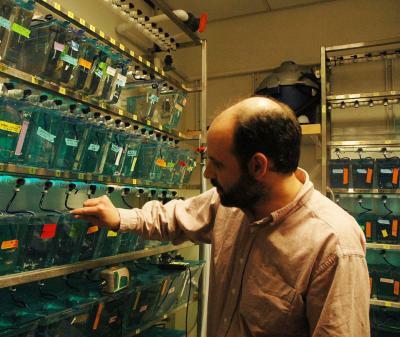 Because zebrafish are transparent, it was easy for the scientists to spot signs of disease. In the fish, growing mycobacteria caused the formation of characteristic structures called granulomas. The fish inoculated with the mycobacteria had a range of outcomes, from resistance to the infection to extremely severe disease. "We were able to divide the fish into multiple mutant classes with distinct patterns of susceptibility to the mycobacteria. Some fish had worse infections than their siblings, and some had very limited infection." 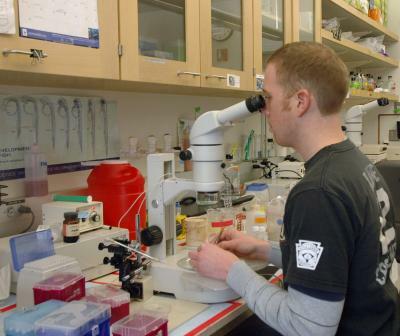 said Tobin, a postdoctoral fellow in microbiology who led the study. "Genetic studies enabled us to map a mutation for hyper-susceptibility to a particular location in the zebrafish genome called the lta4h locus." The lta4h genetic region controls the final step in manufacturing a potent substance that promotes inflammation. However, the researchers discovered a novel role for this particular enzyme. In hyper-susceptible fish the presence of a mutation redirects this process to involve substances called lipoxins, which reduce inflammation. Normally lipoxins are made as the host gains control over an infection. At that point their job is to stop the inflammation. In contrast, hyper-susceptible zebrafish, Ramakrishnan said, are in an anti-inflammatory state even before they are exposed to the TB bacteria. The anti-inflammatory state allows entering mycobacteria to establish an infection and proliferate. This likely happens, the researcher said, because of insufficient production of tumor necrosis factor. Tumor necrosis factor is critical for the control of mycobacterial infection in humans and zebrafish. Tobin said that the lta4h system resembles a rheostat, the electrical devices, such as those inside light dimmers, that increase and decrease the current. "The lta4h locus determines not only the activity of key pro-inflammatory molecules, but also the relative activity of anti-inflammatory molecules, depending on the circumstances. In that way it operates as a genetically encoded rheostat to modulate inflammation," he explained. During evolution this gene has been conserved in many life forms, from fish to people. To determine whether their findings were relevant to humans, Ramakrishnan and Tobin sought the help of Jay Vary and Thomas Hawn in the Department of Medicine and Mary-Claire King in the departments of Medicine and Genome Sciences. Together, they examined the human version of the fish gene in patients with tuberculosis or leprosy. The researchers found that having two different forms of the genetic code at the lta4h locus -- one that promotes inflammation and one that promotes anti-inflammation -- appears to be optimal. Specifically, individuals with both pro- and anti-inflammatory forms of the lta4h locus were relatively protected from TB and from more severe types of leprosy. The genotype at the lta4h locus influenced the outcomes of patients who developed TB meningitis, a dread disease with high mortality, particularly in children. Knowing a patient's genotype at this locus could become clinically useful in TB care, the researchers said. The study of TB was carried out in Vietnam and the study of leprosy in Nepal. Both forms of the lta4h locus are present worldwide. The protective effects appear only among individuals exposed to the bacteria responsible for the diseases. The balanced genotype appears to lead to a balanced inflammatory response. The authors suggest that very strong anti-inflammatory activities may lead to worse infections because of inadequate reaction to the TB pathogen. It is not yet clear why very strong pro-inflammatory activities also lead to more severe disease. However, Ramakrishnan notes that these findings are consistent with something long appreciated by clinicians: that corticosteroids and other anti-inflammatory agents can be useful as adjuvants in some cases of TB where antibiotics alone are failing. Ramakrishnan added that the study underscores the potential for designing pharmaceutical agents to target this particular immune pathway and other regulators of immunity. Such agents would control TB without acting directly on the pathogen, but instead would improve the patient's ability to fight the infection. The findings' implications could extend beyond infectious disease. Imbalanced inflammation underlies medical conditions like asthma, cancer, and certain kinds of heart and blood-vessel problems, Ramakrishnan noted.